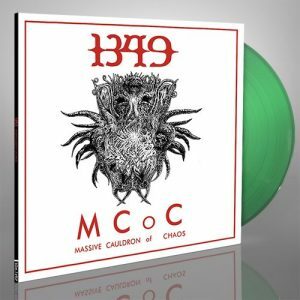 Norwegian black metal masters 1349 will be reissuing their iconic sixth studio album, ‘Massive Cauldron of Chaos’ on both black and green vinyl. The re-release will be made available worldwide on May 17. The LPs can be pre-ordered HERE. Norwegian black metal tyrants 1349 deliver aural hellfire with ‘Massive Cauldron of Chaos’. Over four years in the making, ‘Massive Cauldron…’ builds on their storied career and sees the band sharpen their orthodox black metal assault with a thrashier edge. Iron-handed tracks like “Slaves,” “Godslayer,” “Cauldron,” and more show that without a doubt, ‘Massive Cauldron…’ is true Norwegian black metal and 1349 at their most savage and cruel. Moreover, 1349 have recently released ‘Dødskamp,’ a new single that has been commissioned by Innovation Norway, Visit Norway, and the Munch Museum. Along with four Norwegian artists within four different genres of music, 1349 were asked to interpret their angle on a freely selected work by the famous painter Edvard Munch. The song can be heard HERE. Since the release of the single, Visit Norway has shared a video in which 1349 gives detailed insight as to their inspiration behind the song and why they chose that particular piece. The video can be seen HERE. The new single can be found on all digital platforms here and streamed via the official Season of Mist Youtube Channel below. The song is available on vinyl, together with the bonus track “Atomic Chapel” and can be pre-ordered the Season of Mist shop. 1349 will return with a full length release later this year. ‘Dødskamp’ can can be pre-ordered HERE. When 1349 rose from the ashes of ALVHEIM in 1997, the band was driven by a deep desire to keep the black metal flame burning in all its rebellious glory. The Norwegians set out with the declared aim to remain true to the original spirit of their scene, which they saw heading into all the wrong directions. Conceived around the founding members, which consisted of vocalist and first drummer Ravn, guitarist Tjalve, and Seidemann on bass, 1349 completed their line-up with the addition of guitarist Archaon in 1999 and SATYRICON drum-legend Frost, after the latter recorded a demo and the debut album with the band in 2001. When their debut ‘Liberation’ was finally unleashed in 2003, 1349 took the world by storm with their intense blend of old school black metal soundscapes and ultra-fast aggression. Further assaults followed in rapid succession. ‘Beyond the Apocalypse’ (2004) and ‘Hellfire’ (2005) cemented the Norwegians’ reputation as one of the strongest acts in the already peaked scene, where they managed to carve out a claim for their own. Founding member Tjalve decided to focus on his band PANTHEON I and 1349 have since continued as a four-piece – occasionally adding renowned guest guitarists. Extensive touring aided the growth of a massive following, which started to seriously reach across the Atlantic, when 1349 opened for reunited metal legends Celtic Frost in North America in 2006. In an impressive demonstration that dedication to the origins and early principles of black metal does not have to mean nostalgia and stagnation, 1349 considerably widened their sonic palette with the next full-length ‘Revelations of the Black Flame’ (2009), which was co-mixed by iconic CELTIC FROST mastermind Tom Gabriel “Warrior” Fischer. Their newly found darker and more ambient side, was further explored and interwoven with the earlier sonic approach, which 1349 dub “aural hellfire” on the following ‘Demonoir’ (2010). Extensive touring and performances at prestigious festivals around the globe filled the period from 2010 to 2012. ‘Massive Cauldron of Chaos’ (2013) was the next milestone in the Norwegian’s merciless advance, scoring excellent reviews and sparking more festival shows as well as extended touring, which also brought 1349 for the first time to Australia and New Zealand. Now the band is preparing to unleash more “aural hellfire” onto the expecting world via Season of Mist. For more on 1349, visit their official Facebook page. For more on 1349, visit their official FACEBOOK, TWITTER, and INSTAGRAM.